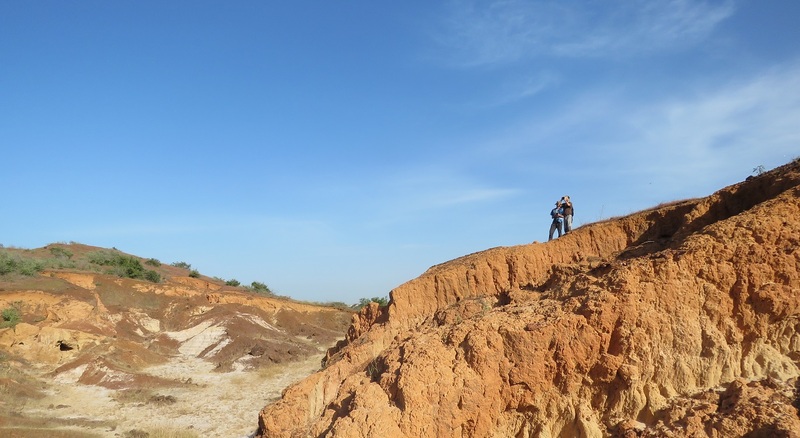 A visit to Popenguine nature reserve a couple of weeks ago quickly turned into a exciting few hours watching a good variety of raptors – something we’re not much used to in this part of Senegal, where there are few sites that are good for raptors, and most of the time anything else than a Yellow-billed Kite, Osprey or Hooded Vulture will qualify as a good record. Here’s a short overview, in order of appearance! As always, several Ospreys were to be seen in the reserve; a few birds usually spend the night on the mighty baobabs that dot the Popenguine savanna, and all day long Ospreys can be seen flying around the cliffs or fishing out at sea. Later that same day at the lagoon just south of Toubab Dialaw, we had a good count of some 29 birds, all visible at the same time (Balbuzard). 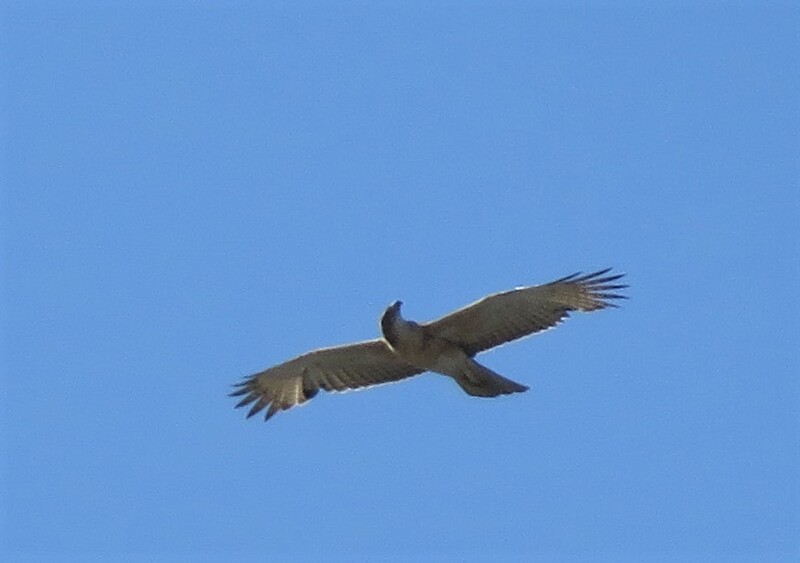 Popenguine of course also had a few Yellow-billed Kites patrolling the area (Milan à bec jaune). As we were looking for a Common Rock Thrush we’d briefly spotted on a ridge ahead of the footpath, we noticed first an immature Peregrine Falcon flying around, then a European Hobby – the latter a scarce migrant through Senegal so always a good find. Hobby was already seen at Popenguine around the same time last year by Miguel. This time round it looked like it was an actively migrating individual, just like a Common Kestrel that briefly made an appearance shortly after (Faucons pèlerin, hobereau et crécerelle). Next up was a Marsh Harrier circling in the distance, again probably a bird on its way to wintering grounds further south (Busard des roseaux). I’ve always thought that Popenguine would be a fairly strategic site to look for actively migrating raptors and other birds. Should be interesting to spend a few days here in October-November and February-March! 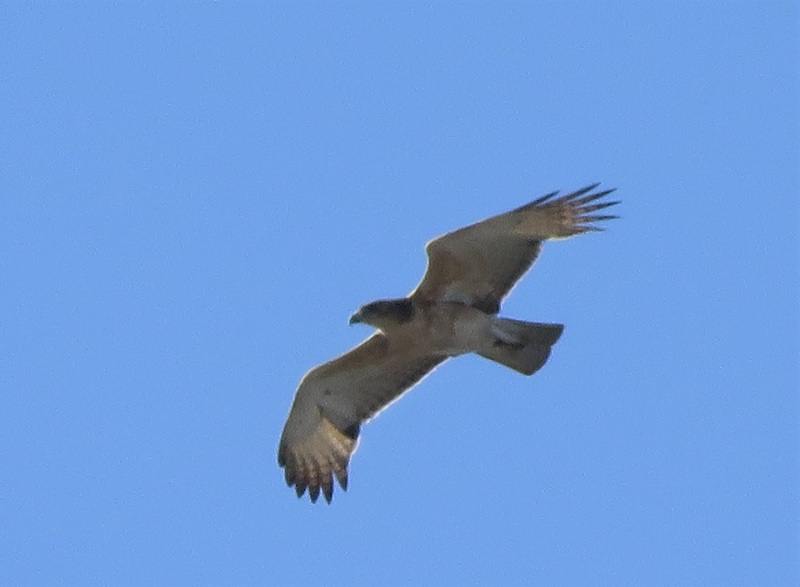 This Short-toed Eagle on the other hand was probably one of the 2-3 birds that typically spend the winter in the area around Popenguine and Guereo. 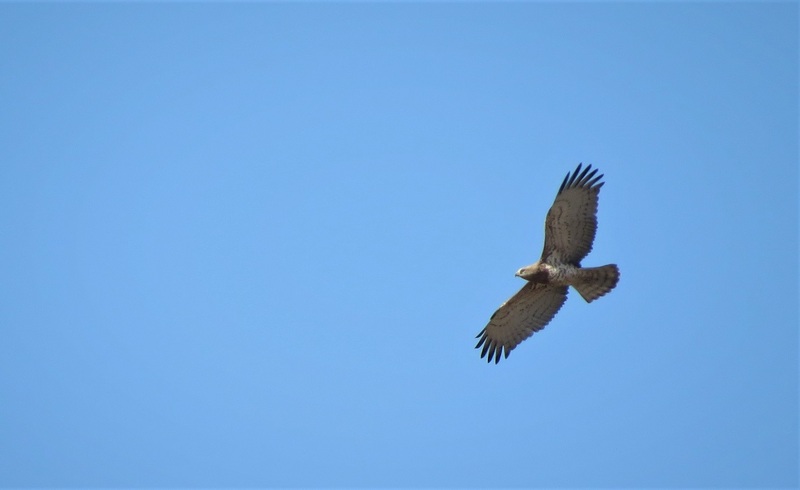 African Hawk-Eagle is reasonable common it seems through the southern half of Senegal, and is a classic sighting e.g. in the Niokolo-Koba area. There are some records from the Saloum delta and even from the middle Senegal valley (as per Morel & Morel and Sauvage & Rodwell), but as far as I know this is the first from the Petite Côte. I’m still hoping to see Bonelli’s Eagle one day in the Djoudj, Trois-Marigots or elsewhere in the Senegal valley, the only area with more or less regular records in winter (mainly by Frédéric, who year after year has documented the presence of a few birds around Saint Louis and who nicely summarised the current knowledge about this scarce species in West Africa, in this post on Ornithondar). 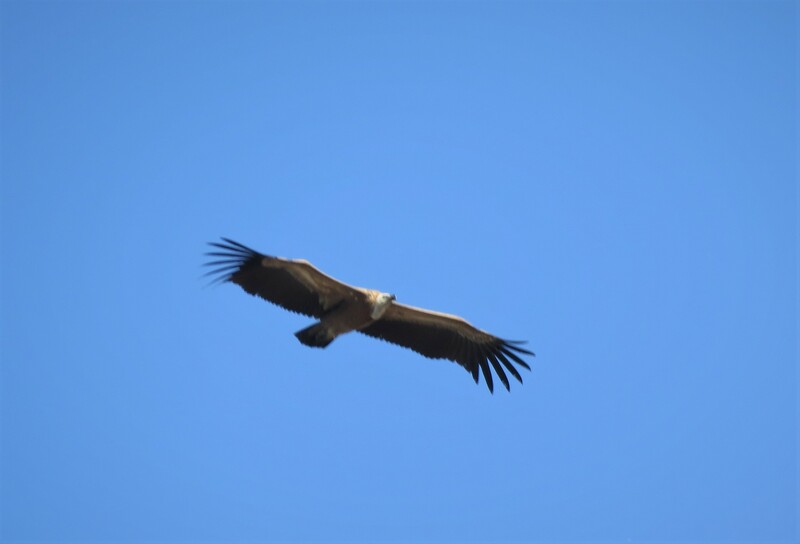 After we’d reached the top of the cliffs, next up was this Eurasian Griffon which appeared to be actively migrating along the coastline, just like a second bird we’d see a couple of hours later that same morning near Yène. Barely a few minutes later, Gabriel strikes again with a young Lanner making a brief appearance, just as we were heading back towards the reserve entrance (Faucon lanier). That’s four species of falcons, not bad! In previous years we’ve also had Barbary Falcon near the cliffs, and surely Red-necked Falcon and Grey Kestrel must also occur at least occasionally, while in the wet season it may be possible to encounter African Hobby. We thought we’d seen pretty much everything when at the last minute a Shikra was seen dashing over the pond (all but dry! ), bringing our morning’s total to 11 birds of prey. Besides all these hooked beaks, as always the nature reserve held quite a few other good bird, such as Gosling’s Bunting, Green-winged Pytillia, Sahel Paradise-Whydah, Blue Rock Thrush, and Northern Anteater Chat. 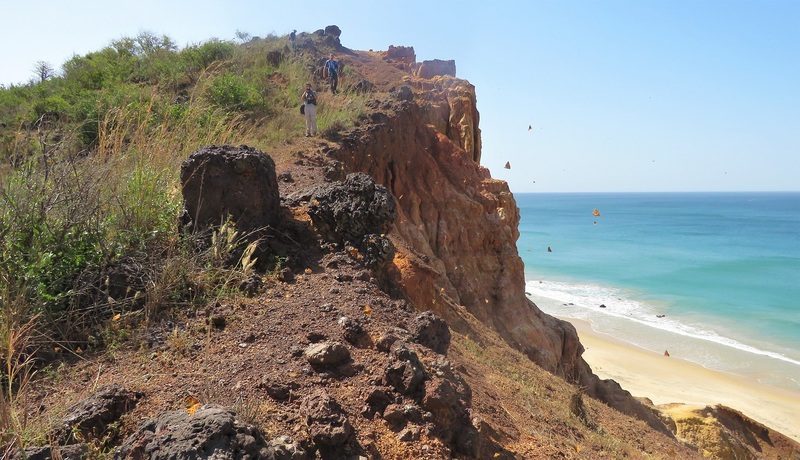 In the end we saw two different Common (=Rufous-tailed) Rock Thrushes, a scarce migrant in Senegal, see this post on our first encounter with the species, in February 2016 at… Popenguine! Also a decent flock of Pallid Swifts and a few White-throated Bee-eaters, both pretty good bonus species, while two Pygmy Kingfishers including at least one dark-billed juvenile provided proof that the species is breeding here. Complete eBird checklist available here. The bird list for the Popenguine reserve now stands at some 198 species, at a minimum that is: I listed more than 20 other species as being most likely present, but which apparently remain to be confirmed. More on that over here. Oh and then there were the butterflies – pure magic! Thousands and thousands of butterflies everywhere, especially along the track up the cliffs. With every footstep, small clouds of butterflies would explode, while a constant stream of butterflies was passing by the cliffs. Our visit clearly took place during peak migration season of Painted Lady which were the vast majority, and to a lesser extent some pieridae. And loads of dragonflies! Difficult to capture on camera but if you look carefully at the image below you’ll get a bit of a sense of what I’m trying to explain here.